I think its always nice to find a easy DIY craft project that is easy to do, and makes a big impact. 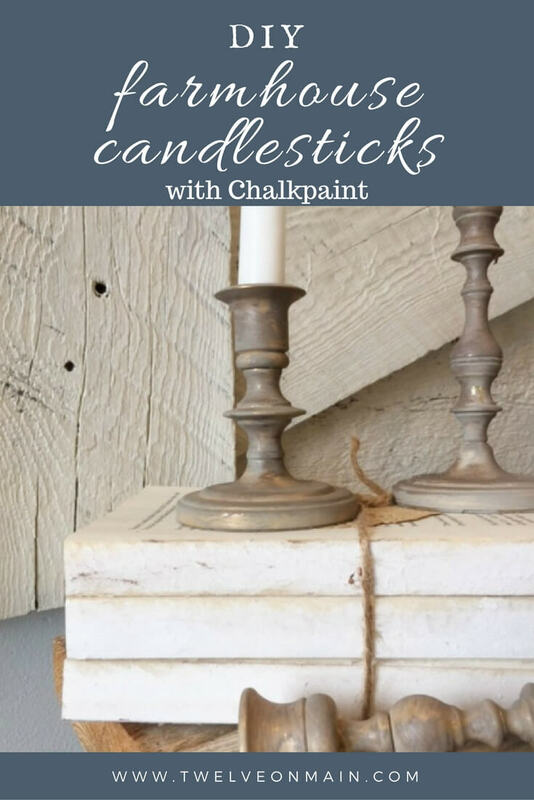 These DIY candlesticks with chalkpaint for your farmhouse decor will do just the trick. I have to tell you a little secret though….my candlesticks weren’t actually from the thrift store. Well… they were on their way. My moms friend was headed to the donation center with a bag full of old brass candlesticks when she thought of me! One call later and they were in my possession. 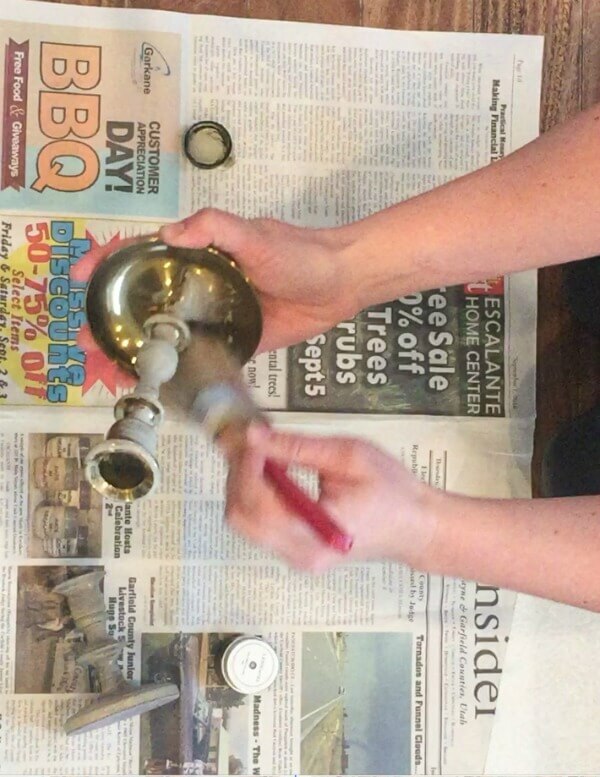 Honestly, I did not know what I was going to do with a bag full of brass candlesticks, but I knew I had to have them! I went through them one by one, searching a bit on the internet to make sure they weren’t of any value, and by chance I have a few that are! So, I kept those babies in a safe space. I knew I could use some of these candlesticks for a craft project, easy DIY project, or simply as some DIY home decor. 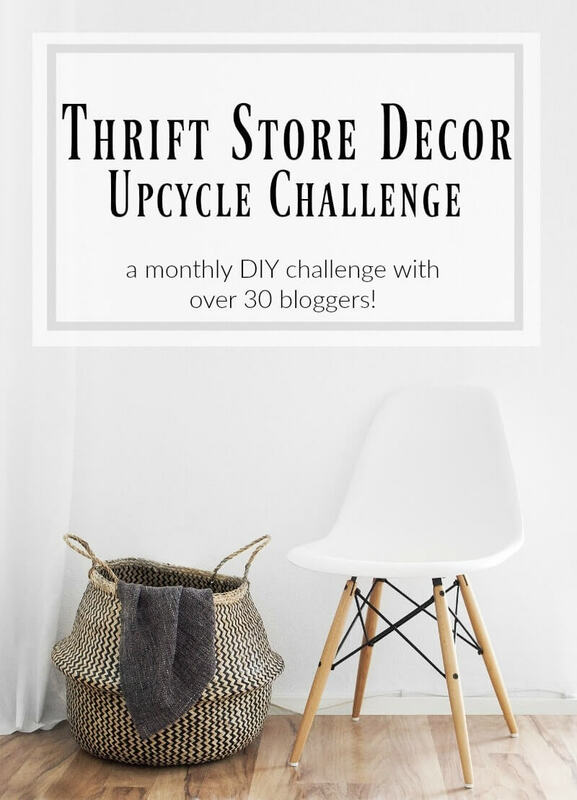 Until recently when I hooked up with some amazing bloggers to do a thrift store decor upcycle challenge. I knew I could use these candlesticks for it. They were going to become some lovely farmhouse decor. There were a few candlesticks that were a bit beat up, had some bent edges and needed a little love, so I knew I could do something with them and make them serve a purpose in my home. I love candlesticks but these brass candlesticks just didn’t go with my home decor, so I decided to do a quick DIY project that literally took 10 minutes to do! I wanted to create a weathered looking set of candlesticks that were more subdued. It was time I made a plan. It was simple really. This was an easy craft project. Make sure to grab some newspaper to protect your surface. You’ve got to be prepared when planning a home project. I applied a little bit of grey chalk paint to my chalk brush. Just a little bit at a time. You want to use a dry brush technique. 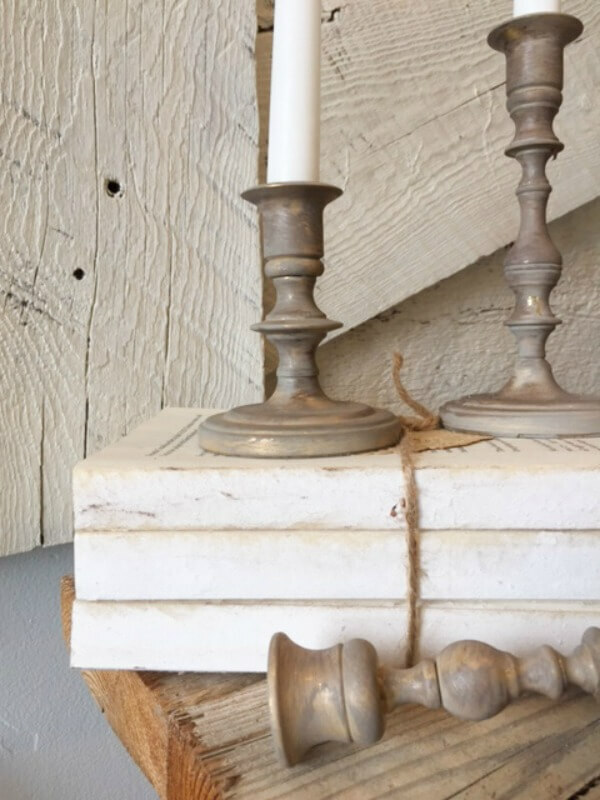 It will give these rustic candle stick holders a more realistic look. Paint on a thin coat onto the brass candlesticks. I wanted a little bit of the brass to show through, so you don’t actually need to cover the candlestick completely. Once the chalkpaint is dry on the candlestick, it’s time to rub on some dark wax. This is really simple. All you need to do is take a paper towel and apply some wax to the paper towel. Then just take the towel and rub the wax all around the candlestick. This step is what creates the farmhouse decor look. Give it a good rub down, and you are done! Make sure not to apply too much wax. A small amount will go a long ways. See, it was that simple. 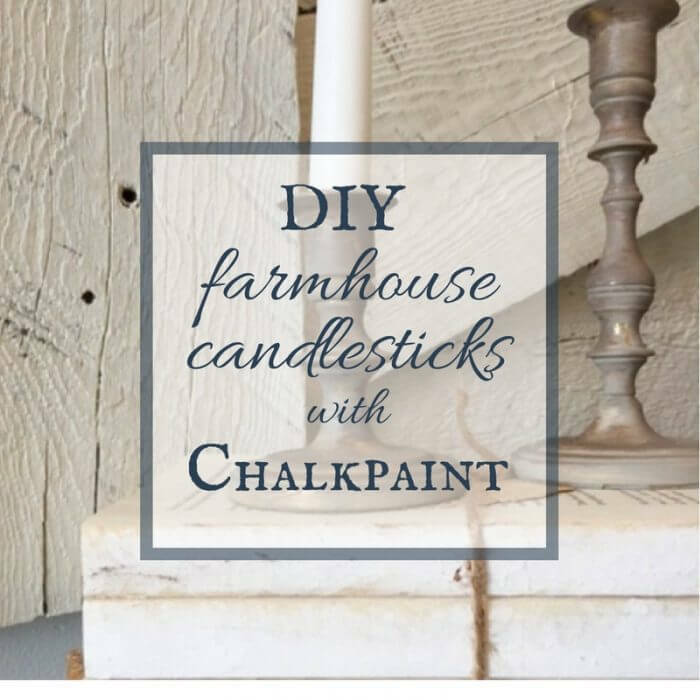 Simple projects such as these DIY farmhouse candlesticks with chalkpaint are a wonderful way to add character to your home. 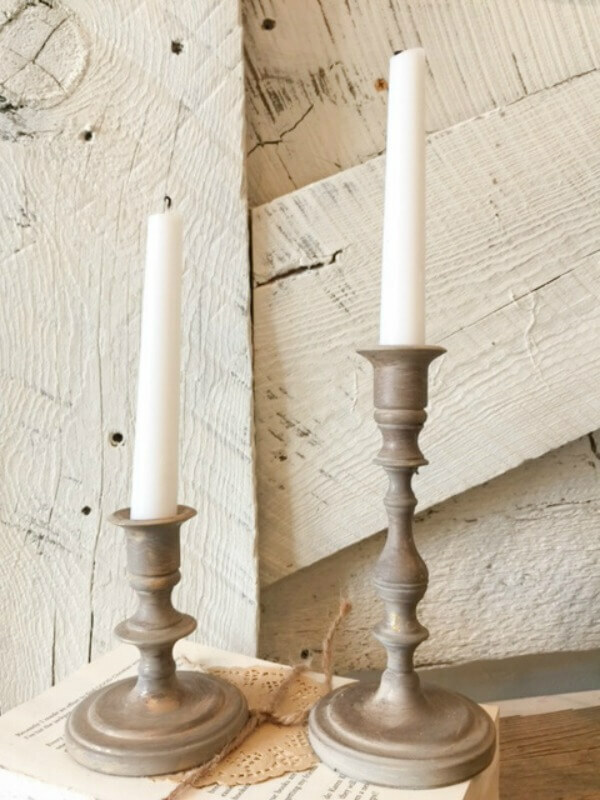 I love the softened look that the farmhouse candlesticks have. The color is perfect and it was such an easy home project. So, if you are looking for ideas for projects around your house, maybe next time you are at a thrift store, keep your eyes out for some discarded candlesticks. You can completely change the look of them with just a few simple steps. I made this fun little video about how I created these DIY farmhouse candlesticks with chalkpaint. I hope you’ll check it out! And that is one more easy DIY project in the books! I am obsessed with creating simple DIY projects these days that will take you less than 10 minutes. Because honestly, who has time for that! 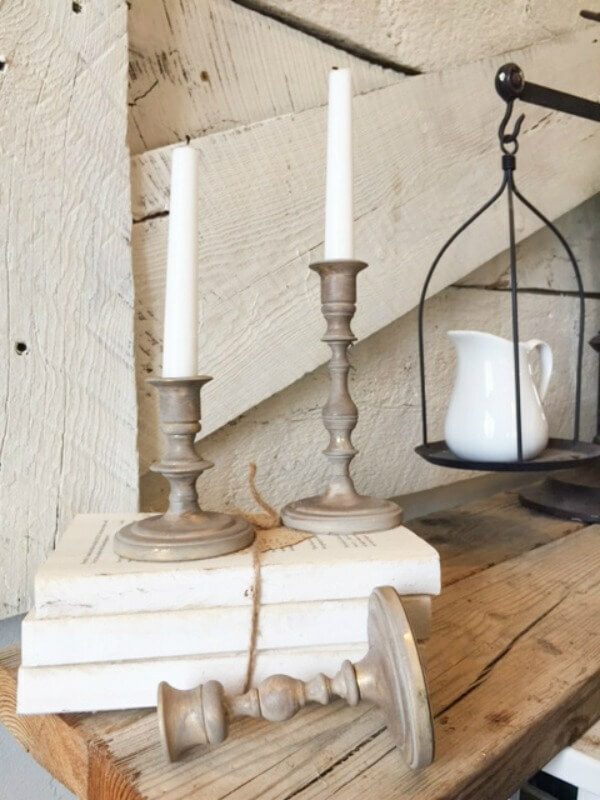 I decided to pair these DIY farmhouse candlesticks with my easy farmhouse style books. Now, make sure you visit some of the other participants in this Thrift Store Upcycle Challenge! Just click on the links below to check out their posts! You guys are awesome! Thanks so much for stopping by. I feel blessed every day that this is what I get to do. I thank each and every one of you for your continued support of by blog. It is truly a dream come true. Have a great day creating easy crafts!! 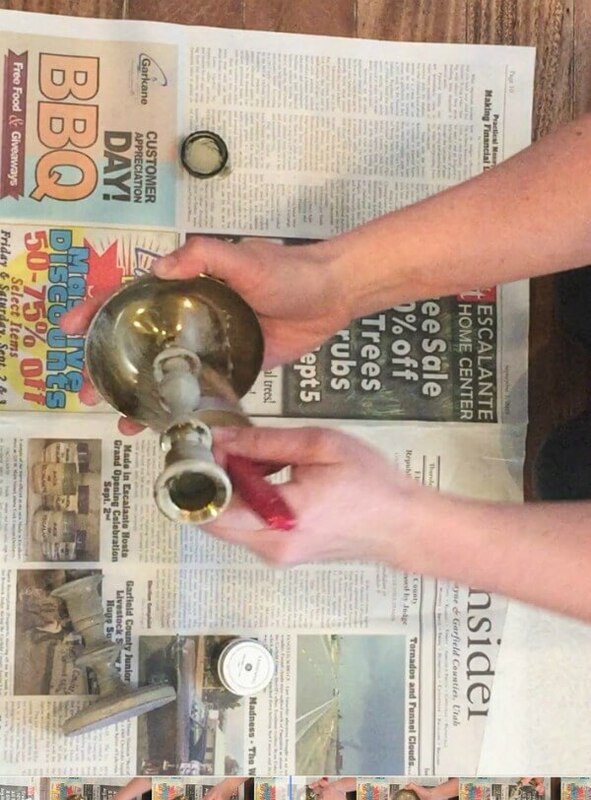 You totally scored on these brass candlesticks. The new paint on them makes them fit in perfectly with the farmhouse look and give them a new life too. Love the look. I’m behind on the times with paint and haven’t used chalk paint before. Your project turned out so nice! Does chalk paint feel like a chalkboard or does it feel like regular paint when you add the wax? Hi! It feels more like regular paint. Especially once it has been waxed. Lucky you to get a collection of brass candlesticks! I just love what you did with them. They truly look like the gorgeous wood farmhouse candlesticks you see in all the high end stores! I’m on the lookout for some now! Wow. They look amazing. Like old wood candlesticks. I can’t believe how much these look like wood! The color is just perfect and you can never have enough candlestick holders! I love them! I love how the paint made the candlesticks look like wood. And what a fast and easy project. That is always a plus. I will be looking for brass candlesticks to try this. 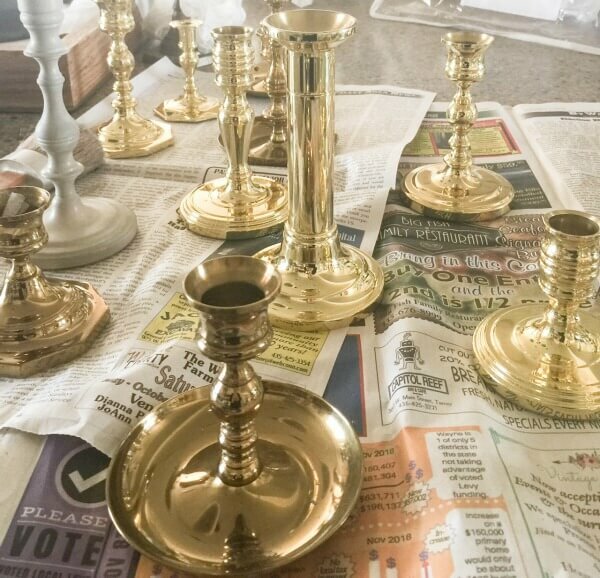 I have some of these brass candle sticks laying around, and I always see them at all my thrift stops, but I’ve been scared to paint them – I am so in love with how these turned out!! I won’t pass them up next time! I love this idea and am going to have to try it out! Pinning! 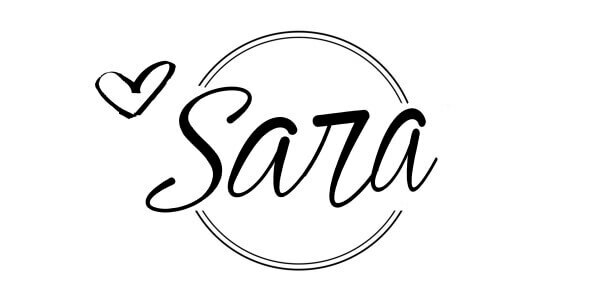 Love the color you chose for these Sara! I didn’t know brass candlesticks could be worth something. You’ve peaked my interest on that! Great makeover! Oh my goodness! I’ve got all a box full of brass candlesticks that are just waiting to be upcycled. Oh I love the transformation on these! Now they definitely fit into the rest of your home beautifully. I love the worn, weathered look you gave them. It is such an improvement over the brass. I also love your video! Great job on that! These are so my style! I will definitely be watching this tutorial again when I find the right candlesticks! Well done. Oh, by the way, I love it when my friend calls me up and says “I have a load of stuff going to Goodwill, do you want to come and check it out”!! Hi I love this makeover! What chalk paint color did you use? Castle? Parisian Grey? I used Parisian Grey, thanks! Super idea and they look like very old and stylish!